Here is a typical example of how the totally fucked up and lawless Nigerian system functions (or rather doesn’t). As reported previously and celebrated by the public, hundreds of cultists including a high number of Black Axe aka Neo Black Movement members were arrested in May 2015 in an attempt to rid Edo State of cult-related crime. These included several cultist politicians who were previously considered untouchable ( https://najuju.wordpress.com/2015/05/15/finally-four-edo-govt-officials-arrested-over-cult-activities/ ). Notorious Black Axe cultists that were unfortunately not arrested, like Tony Kabaka and Oritsebemigho Eyeoyibo, allegedly fled to avoid arrest. Also the National Convention of NBM had been postponed for the same reason. What seemed like a small revolution has now turned into the usual farce that is staged in a failed state ruled by all the wrong people and in which justice does not exist. On June 9, Edo Police Constituted a Special Magistrate Court to Try 215 Suspected Cultists ( http://www.nigeriannewspapers.today/edo-police-constitutes-special-magistrate-court-to-try-215-suspected-cultists/ ). Ever since, nothing was heard again about this trial. And the reason for this is truly scandalous. 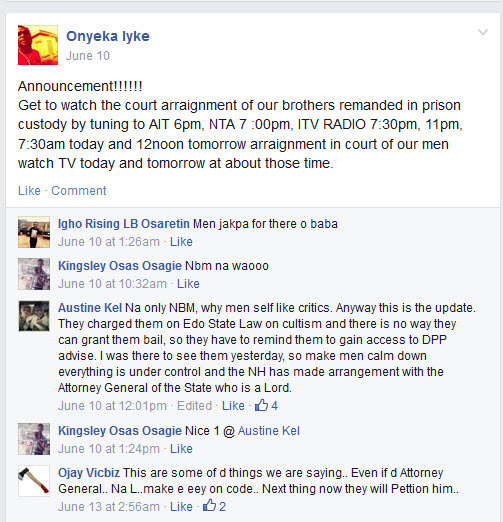 As we learn now, the arrested high-ranking cultists have been set free in all secrecy. How could this possibly be? The National Head of Black Axe aka Neo Black Movement, Augustus Bemigho-Eyeoyibo ( https://bemuda.wordpress.com/2015/01/12/bemuda-cultist-scammer-wannabe-politician/) mobilized a few other high ranking cultists, who have unfortunately infiltrated absolutely all of Edo State. Specifically he apparently made an “arrangement” with the Attorney General of the State who is also a Black Axe cultist. Good to know!! But it still gets more shameless and criminal. The charges for murder and cultism were dropped. Being a member of a secret cult (such as NBM) alone is punishable with up to 20 years in Edo. The cultism charge was reduced to a charge of “unlawful association”. So instead of facing the wrath of the law as they were supposed to, they are now hoping for 25 million Naira damages from the police force for “unlawful detention of members of NBM” (which, just as a reminder, is a worldwide mafia and an illegal group in Nigeria). Also as a reminder, the arrested Black Axe cultists did admit being members, and ample proof is available. 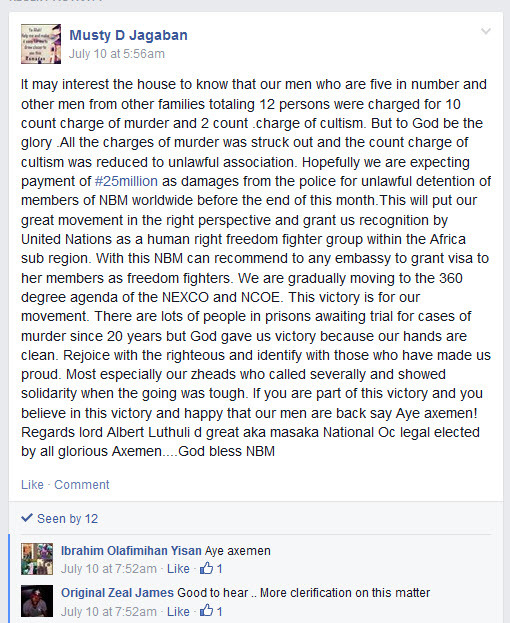 As we can see in the posts above which originate from a secret NBM group, the arrested guys truly ARE cultists from a group that has killed thousands of people and operates a worldwide crime syndicate. But as usual, they will get away with it. It has happened many times before. Various cultist serial killers have been released under “mysterious circumstances”. Because they are rich, and because they have infiltrated positions of power. Whoever is rich has nothing to fear in Nigeria. Bribery gets you everywhere, including out of prison. There is no justice in Nigeria. What a truly failed state! This entry was posted in Uncategorized and tagged Aiye, Arrest, Aye, Bemigho Eyeoyibo, Benin, Black Axe, corruption, Crime, Cultism, Failed Sate, Injustice, NBM, Neo Black Movement, Nigeria, Orientation, OT. Bookmark the permalink. On the question of whether the Nigeria judicial system functions or doesn’t function… This is actually an example of how it can and does function. It’s mechanisms are evidently in place and working. Importantly though in this case it seems NBM members have induced a person to perform improperly a function and ultimately the outcome of the process. Aside from stamping out all the bribery and corruption will IGP be starting to to work on getting to the bottom of all the recent murders. Which are we now saying were solved but now aren’t?? That’s what I mean by “not functioning”. In a functioning system this occurrence could have hardly happened. Unless absolutely everybody involved were a corrupt jerk. I doubt that is the case. The main problem in the Nigerian system are “big men”. When they order something it happens no matter how wrong and immoral it is. “Big men” are mostly shady characters who unfortunately have too much power. And as you know money buys anything in Nigeria. Total disregard of the law, criminals being released without proper trial, known criminals being protected by the police, forged media reports to spread lies, hired assassins…. anything goes if you are rich and know the right “big men”, and even more so if you are a “big man”. Firstly, this was about Benin, not Benue. Secondly, stealing being “abolished” has never stopped corruption and bribery anywhere in Nigeria. Thirdly, you should get your reading and comprehension skills checked, and then think about what makes a country function (for example a functioning justice system, low levels of corruption, and of course the absence of criminal organisations like NBM). 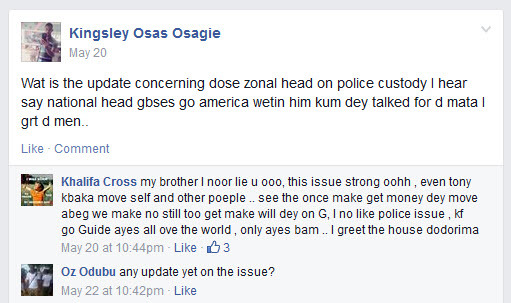 Chief post post,I dey very sure say you not get another work than posting negative things about NBM. However,I no sure say you no be one of those serial killers u keep mentioning.